Day 3 - In Liefdefjorden we will go ashore for a walk on the tundra of Reindyrsflya. Sailing into Liefdefjorden, we will cruise near the face of the impressive Monaco Glacier. The waters of the glacier front are a favourite feeding spot for thousands of Kittiwakes and occasionally Polar Bear are seen on the glacier. Day 4 – 5 - We sail through Beverleysundet named by Parry in 1827 and also sailed by the Swedish-Russian Arc-of-Meridian Expedition in 1898. We push east along Scoresby Island, into Rijpfjord, where in Wordiebukta the German Wehrmacht had the weather station Haudegen until September 1945. The station itself is off bounds, but we can see the outlines in a beautiful surrounding at the head of the fjord. 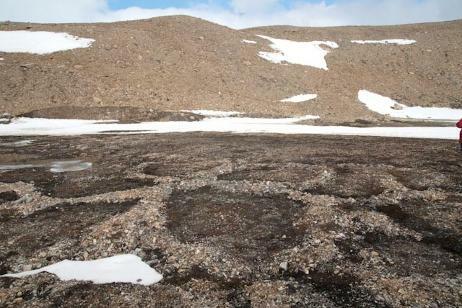 In Zorgdragerfjord one group will walk at the eastern shore while the other group walks along the north side of Arkvatnet through Havsuldalen to the entrance of Duvefjorden. 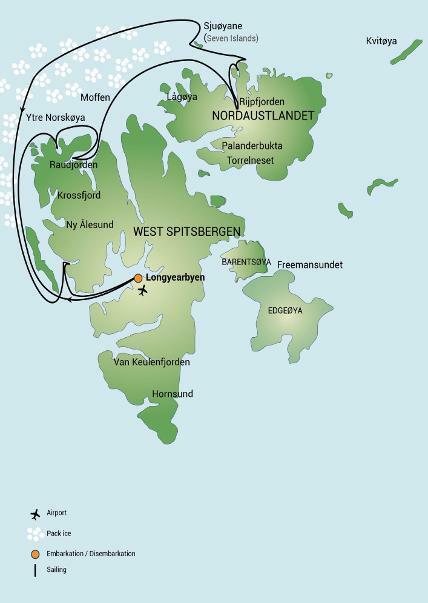 Day 6 – 7 - Today we will reach Phippsøya, in the Seven Islands north of Nordaustlandet. Here we will be at 81 degrees north, just 540 miles from the geographic North Pole. 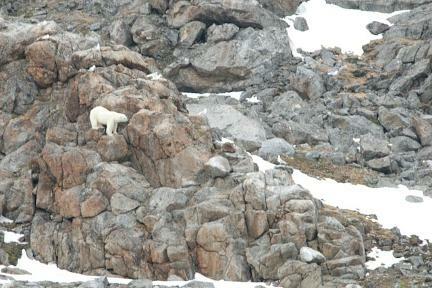 Polar Bear inhabit this region, along with Ivory Gulls and Walrus. In the afternoon we will venture north to the ice to reach our farthest north which may be as far as near the 82nd parallel. Retracing our route westwards, our route takes us through and along the pack ice, keeping watch for Polar Bear and the elusive Greenland Whale (Bowhead). About 40 nautical miles west of Spitsbergen we sail along the edge of the continental shelf, where Fin Whale forage in summer in the upwelling’s along the Spitsbergen banks. At the mouth of Kongsfjorden we have also good chances to see Minke Whale. Day 8 – In Forlandsundet Sarstangen is a possible haul out place for Walrus. Alternatively we sail into St. Johns Fjord or south to the mouth of Isfjorden and land at Alkhornet. Seabirds nest on its cliffs and Arctic Fox search the cliff base for fallen eggs and chicks, while Spitsbergen Reindeer graze the relatively luxuriant vegetation. At night-time we arrive in Longyearbyen. Day 9 - Return to Longyearbyen and disembark for the transfer to the airport and the flight to Oslo and home.